Today I found out sushi is not raw fish, that’s sashimi. Sashimi is just sliced raw fish, sometimes dipped in sauces and sometimes served with sushi. 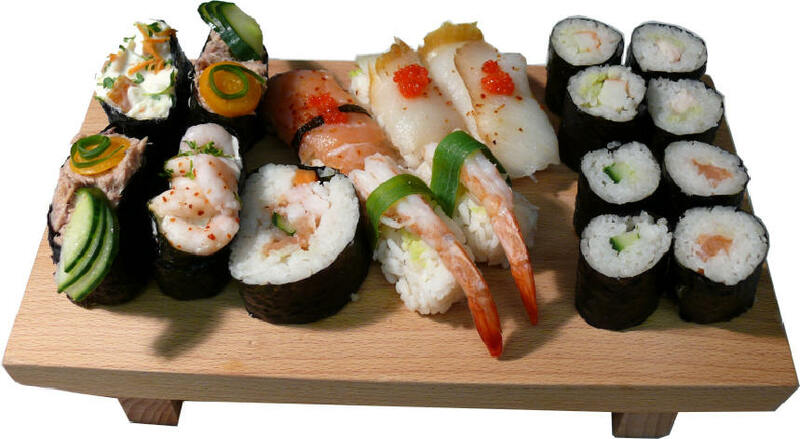 Sushi is any food dish consisting of vinegared rice, usually served with some other toppings, but not always. It happens to often be served with various types of sea food, either cooked or raw, and perhaps even a mix of the two; but that tradition simply comes from the primary food staples of the locations where sushi originated (not Japan, by the way). Sushi can be served with just about any toppings or none at all. The variety of sushi served with raw sea food has given rise to the notion that sushi is any dish served with raw fish. In fact though, sushi is more often than not served in the western world with fully cooked sea food, including: cooked imitation crab (California roll); smoked salmon (Seattle roll); grilled squid or octopus; fully cooked shrimp; and fully cooked clam. It is also often served with fried and battered sea food of varying types. There are also a variety of vegetarian sushi dishes, including the very popular maki (cucumber rolls). Perhaps the reason sushi is so strongly thought of as “raw fish” in the western world is that, whatever the toppings, it is commonly served cold. Also, the general idea of raw fish isn’t exactly to the liking of most westerners conceptually, so that form of sushi stood out more when it was first introduced; giving rise to the notion that sushi was any dish that included raw fish. The term sushi, literally means “it’s sour”, and comes from an ancient grammatical form that is no longer used in other contexts. The “sour” description comes from the ancient way of preparing sushi by fermentation of meat, generally sea food, packed in rice with salt used as a preservative. The vinegar produced from the fermenting rice ends up breaking down the fish meat into amino acids. This, in turn, results in a strong umami flavor, which is one of the five basic tastes the human tongue can detect. Once the meat was properly fermented, thus preserved, the rice would then be discarded and only the meat itself would be eaten. Basically, it was just a handy way to preserve meat before ice boxes and refrigerators. Modern forms of sushi are not typically prepared in this way and the rice is now the main part of the meal. Around the Muromachi period (1336-1573 AD), they began adding vinegar, which aided in preserving the food and in improving the flavor. Eventually, this lead to the fermentation process being shortened and ultimately abandoned in favor of just eating it right away with the rice. A few centuries later, osaka and sushi combined to form oshi-zushi. In this type of sushi, various types of sea food and rice are pressed using molds. This eventually led to the version of sushi created by Hanaya Yohei, in the 19th century, which most of the world thinks of as “sushi” today. In this form, the sushi can be prepared extremely quickly and eaten with one hand, making it one of the earliest forms of fast food. Sashimi is considered a Japanese delicacy and is made from fresh, raw seafood that is sliced into thin, small pieces, which are then to be dipped in various sauces, such as soy sauce with wasabi paste. Each piece is typically about one inch wide by one and a half inches long and one fifth of an inch thick. The word sashimi means “pierced body”. The word is thought to have derived from the fact that, traditionally, sashimi would have the fish tails or fins stuck to the meat itself, so you could identify what fish the meat came from. Alternatively, from the fact that as soon as the fish used for sashimi are caught, the brains are pierced to kill the fish without damaging the meat; this also minimizes lactic acid in the meat by killing the fish instantly, which allows the fish to store longer (as many as 10 days) without degrading in quality. Once the brain is pierced, the fish are immediately put in ice. Sushi served rolled in dried sheets of seaweed is called makizushi. In bowl form, sushi rice, with toppings scattered over it, is called chirashi-zushi. Sushi comes from Southeast Asia, not Japan; it is still very popular in both Southeast Asia and Japan today. It is thought that it was introduced to Japan in the 7th century from China. The name of the modern form of sushi called Edomae nigirizushi comes from the fact that it was originally made with freshly caught marine life from Edo Bay (Tokyo Bay). I am Japanese and I can tell you this article is not entirely correct. Sushi is raw …PERIOD… unless it’s tempura. @Kya Takako: Being Japanese has nothing to do with expertise on sushi. A simple Google search will show you that Sushi is not “raw… PERIOD”. Shime-saba Traditional, and the mackerel is “cooked” in vinegar first. Ebi (shrimp), and Tako (octopus) are normally boiled before their use in sushi, at least in modern Japan. The vast majority of nigiri-sushi uses raw ingredients, but it isn’t exclusively so. “Sushi is Not Raw Fish” with my primary source as a Google Search. Dude, you’re an idiot. Okay yeah the term ‘sushi’ refers to any dish with the vinegar-rice but I don’t understand your assertion that it is not raw fish. It definitely can CONTAIN raw fish, which by itself is sashimi, and can also contain shrimp tempura, avocado, basically anything else. It’s misleading and stupid to call the entire article something that is basically not true. @Patrick Shaefer: “It’s misleading and stupid to call the entire article something that is basically not true.” No, it really is true. Do a little more research if you’re not satisfied. Or, you know, read the whole article where I expound on the topic at hand. Had you done that, you would have noticed that, like other articles on this site, “References” are at the bottom and none of them are Google Search. My suggestion of “Google Search” was just for individuals who don’t like my sources and are still skeptical after reading the article. I appreciate skepticism. I tell people all the time here to “question everything”, because nobody bats a thousand. Every reputable source and expert out there gets things wrong sometimes, even in the field of their expertise. There are no exceptions. However, just essentially saying “You’re wrong and I’m right because I know I am…” including often not bothering to research the topic at all, as so many don’t, that’s not the route to go. Back up your assertions with actual sources or data. To do that, Google is a good place to start, hence the suggestion above. “Dude, you’re an idiot.” It’s not the first time I’ve been called that- it’s the internet after all where many who leave comments seem to throw all civility out the window for some odd reason- but it never helps the person’s argument. Whether I’m an idiot or the smartest person on the planet has nothing to do with the topic at hand. Smart people sometimes get things wrong, just as dumb people sometimes get things right. So you start by agreeing that sushi, by definition is not raw fish, but then argue Daven is an idiot because it can contain raw fish? The whole point of the article was to dispel the common misconception that sushi is only sushi if it is raw fish or contains raw fish. Daven, I like your style. Civil, smart, and classy. This is a prime example of a useless fact. Useless because sharing it with the sort of people who believe things without evidence changes nothing. Of course sushi has no raw fish… the simple fact of being involved in acidic mixture of rice with vinegar cooks the fish. Acidic sources like vinegar, citrus juices or even herbs with acidic/sour juices, act over raw food as a pre-cooking… that’s a culinary staple! The non japanese origin of sushi brings us to another fact, afterall the most iconic japanese dishes aren’t japanese at all… like TEMPURA! Fish, seafood or vegetables dipped in a batter and deep fried… is a very old and popular portuguese cooking technique – still in use – called “albardar” which can be roughly translated as “coating”. Vegetables cooked the very same way, under the name of “Peixinhos da horta” or “little fish from the garden”, were a substitute to the fish version, during those fastening periods of the christian religion liturgical calendar, where people should abstain from eating any kind of meat (flesh or fish). Those periods take place four times a year and were called, in latin “jejunia quattuor temporum” or “four seasons fastening”, each one shortly known in those times as… “TEMPORA”. The portuguese culináry influence in actual Japan desn’t end on Tempura. Kasutera, a Nagasaki widely known cake is no other than the japanese version of the traditional portuguese cake “Pão-de- Ló” also known (at that time) as “Pão Castelo” (Castle Bread/Cake) hence Kasutera. I love everyone who doubts you. After saying, “you’re an idiot”. They then prove what you said to be true. The people that need to go back to school is awesome! I don’t exactly care what sushi is, really. I was put off for years about the raw fish thing – until I actually tried it. It’s actually pretty good, regardless of what’s in it. “Smart people sometimes get things wrong, just as dumb people sometimes get things right.” This is such a nice quote, I’m gonna turn this into a meme and quote it. Also, I was told that Wasabi was used in ancient days because sanitation was poor back then and wasabi kill’s bacteria/virus, i.e. Ecolie, etc. Have you heard any of this? @Daven Hiskey: Have you ever thought that maybe stuff on the internet mightn’t always be correct. On sushi, not all sushi ‘products’ are traditional, just like so many other ‘claimed’ products aren’t truthful to their traditional heritage. Those roll thingies with the rice are not sushi, they are called California rolls. Sushi is slices of raw fish, but very special fresh and high quality fish, otherwise you’ll get sick. @Geoffrey Lannister Not true. “Those roll thingies with the rice” is in fact sushi. What you put in them changes what they are called; ie.. imitation crab makes them “california rolls.” But, they are still a form of sushi. Slices of raw fish is called sashimi but that’s not entirely true either. Sashimi can also be raw beef, chicken, pork etc. it is just raw “meat.” Sushi is JUST vinegar cured rice, nothing more. Oh, I forgot to add a fun fact! Sushi (balls of vinegar cured (cooked) rice) with sashimi (raw meat or fish) on top is called nigiri! *seafood. It’s one word. No need to thank me, just payin’ it forward. Let’s make this clear, as it looks like this article created quite a lot of confusion. Daven’s opinion comes from lack of experience, trusting Google and Wiki files while ignoring true life experience. Maybe Daven is just becoming familiar with the fashionable Japanese tradition of eating raw fish and rice as fast appetizer, often served with Sake or Beer to consume with colleagues after work, before going to have a proper dinner. Not so long ago it became popular in western country, as well as US where the minimal and artistic approach of Sushi preparation turned into “mango-jambo sushi slam!” or any other gigantic avocado, mayo, cooked or grilled fish combination far from what Sushi represented in the Japanese culture. However, if you ever had a dinner at a Sushi restaurant you would definitely know that 90% of what is called Sushi, Sashimi or Maki Rolls, is definitely raw fish. Some American fast food or food courts sushi restaurant found in malls serve “cooked” sushi to appeal more people who are probably not so used to the traditional Sushi art. I suggest Deven to write articles based on his experience and not on a quick Google research, which will result in a totaly different opinion. Enjoy Sushi, with moderation and respect the traditions! He based it on historical documentation of the original sushi, not Japanese raw fish variants. As he pointed out in the article and which is credited and an original fact from history is sushi meaning “it’s sour” because it was fermented rice around fish to “cook” it so it would last longer because they did not have refrigeration units back then. I suggest you research your little snit fits about the author before claiming he is stupid, because this article was pretty much on the spot about everything. Some things may be a bit off, but it was all basically correct. Sashimi is raw meat, mostly fish, sushi is fermented rice vinegar used to preserve fish, which later became a part of the actual food that one would eat. Those sushi restaurants do not HAVE ancient sushi, they have Westernized variants to appeal to Americans and call them sushi because most Americans are just ignorant to the fact that they are serving sashimi and not just sushi. I am basing this on experience and not on Google searches. I am basing this upon historical documents. Perhaps instead of ridiculing the author based upon your limited view based on western versions of an ancient food, you should do actual research like the author did and you would come to the same conclusion. FYI it’s not Japanese, if you had researched anything about it or had experience with it, you would have known that someone would correct you on the original lineage of this traditional food. If you want original, it’s fermented rice around fish that is soured. Fish cheese. So, in essence, you showed no respect to respect to the traditions by contradicting fact and actuality. Cheers. Also, I do believe most of the negative responses to this article have to do with the fact that while TRADITIONALLY, “Sushi” refers to the vinegar cured rice, regardless of the toppings. While this article is 100% correct in dispelling the myth that sushi refers to the raw fish topping (sushi toppings are generally called “netta”, I believe) what the article SEEMS to be saying is “What you think of as sushi isn’t really sushi and you’re wrong.” In reality, the connotation of the word has simply changed for Americans. Generally, the sushi you can find in America DOES have raw fish in or on it, and saying that “that’s not sushi” (again, this is more subtext than what the article ACTUALLY says) confuses people because it’s not EXACTLY true. Also, more often than not, different types of sushi are mislabeled as “California Rolls” (which REQUIRE fake crab meat and/or avocado to be called such). This is presumably done to encourage customers to buy it who may falsely equate “sushi” with “raw fish” since, as you said, many westerners find the idea of eating raw fish off-putting. However, what people generally “imagine” as sushi (usually they imagine either maki-zushi or nigiri-zushi with raw fish in/on it with nori (dried, seasoned seaweed) on/around it) IS ACTUALLY A KIND OF SUSHI. It’s just that it’s not the ONLY kind of sushi and sushi itself does not require raw fish to be considered sushi. To use a metaphor: A square IS a rectangle, but a rectangle can never be a square. What I mean by that is, while raw fish netta IS a common topping for sushi, it does not DEFINE the food we call sushi. In fact, onigiri (those “rice balls” you often see in anime. They’re basically triangles of sushi rice, often with a small rectangle of nori to hold it by so it doesn’t stick to your hands.) and maki sushi (the kind with julienne cucumber, as you said) ARE legitimate sushi. Sushi does refer to the rice, regardless of the kind of topping. Sliced, raw fish by itself is called sashimi. Also, I do believe most of the negative responses to this article have to do with the fact that while TRADITIONALLY, “Sushi” refers to the vinegar cured rice, regardless of the toppings, the connotation in America is different, and, quite frankly, not generally wrong. While this article is 100% correct in dispelling the myth that sushi refers to the raw fish topping (sushi toppings are generally called “netta”, I believe) what the article SEEMS to be saying is “What you think of as sushi isn’t really sushi and you’re wrong.” In reality, the connotation of the word has simply changed for Americans. Generally, the sushi you can find in America DOES have raw fish in or on it, and saying that “that’s not sushi” (again, this is more subtext than what the article ACTUALLY says) confuses people because it’s not EXACTLY true. Also, more often than not, different types of sushi are mislabeled as “California Rolls” (which REQUIRE fake crab meat and/or avocado to be called such). This is presumably done to encourage customers to buy it who may falsely equate “sushi” with “raw fish” since, as you said, many westerners find the idea of eating raw fish off-putting. However, what people generally “imagine” as sushi (usually they imagine either maki-zushi or nigiri-zushi with raw fish in/on it with nori (dried, seasoned seaweed) on/around it) IS ACTUALLY A KIND OF SUSHI. It’s just that it’s not the ONLY kind of sushi and sushi itself does not require raw fish to be considered sushi. Also, since I suddenly realized someone might bring this up: yes, I know the “retro” children’s electronic virtual pet is called a “Tamagotchi” and not “Tomogatchi”. I deliberately misspelled it because it’s my little way of poking fun at the way America has the unfortunate habit of mispronouncing foreign words according to common American phonemic sequences. I always cringe when people call it a Tomogatchi (though it does make an interesting pun, as “tomodachi” means “best friend” in Japanese, I believe. ) For curious people, Tamagotchi comes from the combination of the Japanese word for egg (tamago) and the English word “watch”. But yeah… sorry for the tangent. Also, sorry for the typo in my first comment. Well I may not be a sushi expert, or Japanese by ethnicity, but I was born there and lived there for a time and have been back many times. I’ve eaten a lot of Japanese food, being that it is my favorite kind of cuisine, and that includes a lot of sushi and sashimi. With that said, I don’t get the finger-wagging from some folks on this article. It’s relatively clear what this is about: an incorrect generalization that many westerners have about sushi. A lot of people who’ve not eaten it think it is literally pieces of raw fish, like sashimi, or always must have raw fish in it, which of course is untrue. Even a leisurely amount of research about sushi without leaving home to ever eat any, reveals that many sushi have no raw or even cooked fish. You can find them in Japan easily. They will have various names that may not sound as simple as “sushi”, but that’s the same as “fettuccine alfredo” not including the word “pasta”. It’s still pasta. “Sushi” is a broad category of food characterized by vinegared rice prepared in a generalized way. Other ingredients are highly variable. Yes, a lot of it includes raw fish in Japan, because that is a popular ingredient (and most raw fish, when fresh is very good indeed). But that does not mean that “sushi = raw fish”, anymore than “pasta = spaghetti”. Sushi = sashimi + vinegared rice, as noted, except when it contains a non-sashimi topping like shrimp tempura. Then it’s still “sushi,” but without the sashimi ingredient. To stick with the example, shrimp tempura is shrimp that started out as sashimi, then was cooked (battered and deep-fried). Sashimi can be raw or cooked, and can consist of fish — or not. Either way it’s still called sashimi. Tamago (egg/ommelette) sashimi is a common example. It’s not fished and it’s not raw and it is sashimi, when served as such (without rice). But serve it over rice and you have tamago sushi. And all the “sushi” you’ll ever see is “nigirizushi.” “Nigiri” just means “grip” — that is, sushi that you can pick up and eat. As for the title of the article, “Sushi Is Not Raw Fish” — that makes it seem like sushi contains no raw fish. But nobody confuses the rice for fish, raw or otherwise, and sushi frequently does include raw fish. It’s just that not all dishes classified as sushi do. Finally, I agree that the meme “sushi = raw fish” gained traction in the West because raw fish was sushi’s most unusual feature. That it also contains rice doesn’t disqualify the fish on the sushi as sometimes being raw. And I doubt the claim, in the comments, that resting sashimi on vinegared rice instantly “cooks” it. Yes, chemical reactions happen there, but they don’t amount to what anybody considers the cooking of meat or fish. And the baloney about acidity cooking food – cooking is heat. Acid does not (always) provide heat. There may be anti-bacterial properties but is that really cooking? How long is the fish wrapped in the acidic rice before it is consumed, 5min, less maybe? Is any appreciable portion of the meat in actual contact with acidic rice with all the other ingredients found in typical rolls? Stumbled upon this article. It is a good little trivial fact to know. Hope that the author still read up on the comments here. Thanks! I enjoy cooking and now I have some trivia to back it up when I prepare “sushi” rice for nigiri or top it sashimi. Barring the trolls I find that this article is correct that Japan gets a majority of her cultures from the influences of neighboring and foreign countries through trade or tourism or media. I must admit, at first, I did thought the WORD sushi meant “raw fish” from the clarification found in the theme of this article it is “vinegar-ed rice.” As a Japanese…ish person who have been Westernized I had ignorantly thought it as I saw it. So for the longest running I had associated the word “sushi” with any raw fish in Japanese food. A misconception that was identified and addressed by this article.